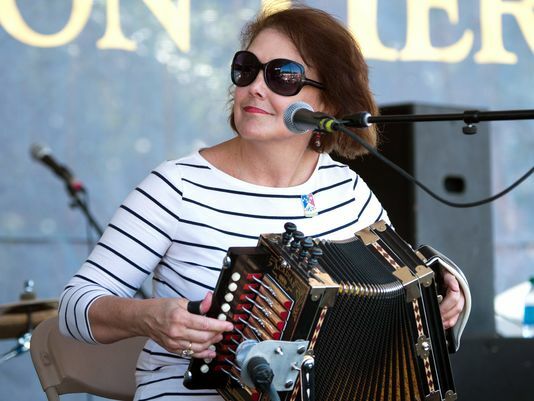 Aucoin’s tub bass has Lisa Trahan et L’esprit Cadien among the nominees for the Le Cajun Awards, Grammy-style trophies issued by the Cajun French Music Association. ositions (de Lisa Trahan ou d’autres artistes), avec aussi quelques traditionnels, dans un fort sentiment d’unité créé par Lisa Trahan (mélodéon, triangle, rubboard, chant), Shannon Comeaux Aucoin (guitare, chant), Louie Aucoin (basse folklorique, chant), Henry Hample (violon, chant) et Kenny Alleman (batterie). En voyage ! Though Lisa Trahan was practically incubated in Cajun music and a Magnolia Sister since 1996, only now does she step out with her own ensemble and a debut CD. And like the band namesake implies, this group has plenty of spirit. But rather than go for the gusto of a slick dancehall sound, the group prefers it on the folky side, especially given Louie Aucoin’s thumpy washtub bass. With four of the five members (two gals and two guys) contributing at least one vocal track, the feeling is one of community and balance. Trahan plays with a knuckle-busting drive on accordion with a draft wind of trills and honks; fiddler Henry Hample bows with gorgeous tonality. In between bluesy shuffles, waltzes and swinging numbers, it’s exceedingly dance friendly without necessarily being pure dancehall. Song-wise, it’s obvious the group chooses the material it likes, such as Louie’s graceful rendition of DL Menard’s “Je peux pas t’oublier” while Shannon, Louie’s guitar-playing wife, comes close to how Adam Hebert sounded on “Je suis après m’ennuyer.” Two songs have rarely been covered—Cleveland Crochet’s “Telephone Port Arthur” and Octa Clark’s whirling dervish “Polka à ma vieille tante” that’s quite the galloping tune. But what are the most amazing are Trahan’s three originals that are also her very first songs and deal with family memories, personal stories and inside jokes. If these shoes could talk, they’d say there’s plenty of life in these soles..